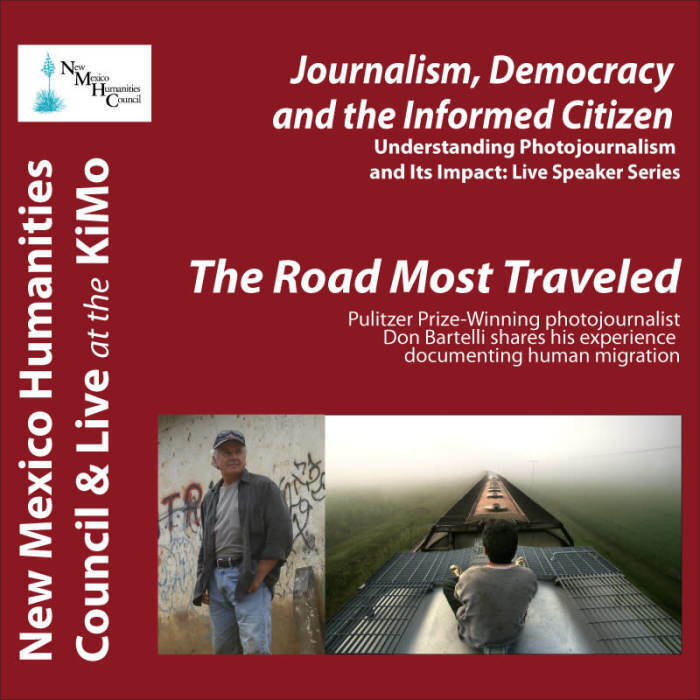 Albuquerque, NM - After almost 4 decades working along the U.S./Mexico border, Pulitzer Prize winning photojournalist Don Bartletti believes migration for survival is as old as humanity, unstoppable as the wind and frequently misunderstood. In his 1-hour illustrated lecture he details how he photographed courage, fear, joy, hate, hope and heartbreak on both sides of this political boundary. The New Mexico Humanities Council is hosting Bartletti’s presentation of The Road Most Traveled: Causes and Consequences of Illegal Immigration as well as a full slate of events in Albuquerque on Oct. 4-5. Like a visual anthropologist Bartletti takes his audience through 38 years and 1200-miles of the border fence. In 1979 it’s little more than barbed wire pounded into the mud by thousands of feet; in the mid-80’s it looks like a schoolyard barrier with countless hands clinging to the chain links. By the turn of the 21st Century it’s a 2-story barrier topped with coiled razor wire between Tijuana and San Ysidro. On the east side of the Colorado River it’s a 12-ft-high steel plate that extends arrow straight across miles and miles of the vast Sonoran desert. Along the winding Rio Grande River in Texas the steel pickets occasionally take a shortcut, putting some ranches and homes on the south side of the fence. On the U.S. side of the border, deportation, nativist backlash and protests large and small are fodder for pundits, politicians and your neighbors. Bartletti’s narration of his photographs is mercifully devoid of spin about America’s most politically charged debate. He keeps us clearly focused on what he witnessed in real time. In 2003, his 6-part photo essay in the Los Angeles Times, “Enrique’s Journey” was awarded a Pulitzer for Feature Photography. Bartletti was the first U.S. photojournalist to document the ongoing Central American diaspora of children clinging to freight trains and their dreams of crossing into the U.S.
Bartletti retired from the Los Angeles Times in late 2015. He is a guest lecturer and teacher at universities, high schools and civic organizations in the U.S. and Mexico. His photographs have been exhibited in museums internationally and are published in books and scholarly studies. Visit our website at https://ddei3-0-ctp.trendmicro.com:443/wis/clicktime/v1/query?url=www.nmhumanities.org&umid=96364998-728E-D305-8C79-0466054F4BF3&auth=f0ebcd052f61e7a39dc93191e8a01d02608499af-89f0d853b7d14286d88e7c558c53944e2d491f96 for details on these programs with Don Bartletti, or call (505)633-7374. October 4 │ 4:30 p.m. Exclusive, catered reception: Meet and mingle with Don Bartletti before the lecture. 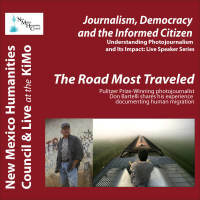 October 4 │ 6:00 p.m.
Bartletti will discuss the lives he chronicled during his long career on the border in his talk. This program is free and open to the public. Don Bartletti's, six-part photo essay in the Los Angeles Times, "Enrique's Journey" was awarded a 2003 Pulitzer for Feature Photography. Bartletti was the firs U.S. photojournalist to document the ongoing Central American diaspora of children clinging to freight trains and their dreams of crossing into the U.S. Join us for Bartletti's public presentation, "The Roads Less Traveled: The Causes and Consequences of Illegal Immigration."